My friend Rob Nunn blogged recently about the debate as to whether adapting Sherlock Holmes for younger readers is a good thing or not. Personally, I’m not a fan of “Canon light,” but I own several such books and have written about them. Rob’s blog called to mind a 25-cent purchase that I made last year at a second-hand shop in southern Illinois. 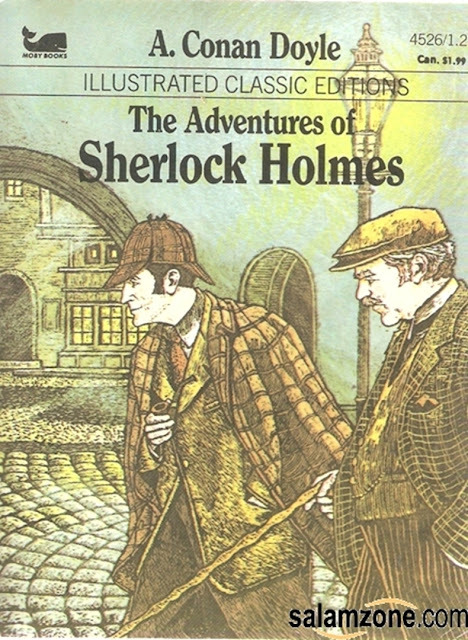 It’s a 4-1/8-inch by 5-1/2-inch paperback Illustrated Classic Editions version of The Adventures of Sherlock Holmes. The handwritten inscription inside says “Merry Christmas Aaron from Mr. B, 1985.” I cleverly deduce that it was a present from a teacher to a student. I thought I already owned this volume (and indeed I did). But even though I’m not a collector, how could risk being wrong when the price was only a quarter? It turns out that the contents of the volume are identical to the Great Illustrated Classics edition also on my shelves. The Great Illustrated is much bigger at 5-3/4 inches by 8 inches and has a different cover illustration. It’s also a hardback. But inside, the books have the same three adaptions by Malvina G. Vogel – “The Red-Headed League,” “The Adventure of the Speckled Band,” and “the Adventure of the Copper Beaches.” Great selections, I say! The biggest defect of the adaptations is that they are told in the third person. For heaven’s sake, why? Much of Watson’s character is conveyed to us by the way he tells the tales. Whichever edition you happen to pick up – Great Illustrated Classics or the more modestly named Illustrated Classics Editions, the drawings are worth the price of admission. But I’m still not a fan of adaptations of the Canon for children – except perhaps for the very, very young.